The RIO Gold fly line has a revolutionary taper design that gives incredible loop stability at distance, a unique profile that allows a rod to load at close range and a front taper that delivers perfect presentation of flies between sizes #22 and #2. The RIO Gold is the ultimate all round, floating line for the trout fly fisher. Featuring Rio’s unique Maxcast taper which allows the rod to load at close range and a positive front taper that delivers perfect presentation of flies between sizes #22 and #2, RIO have produced the ultimate all-around, floating line for freshwater fly fishing. 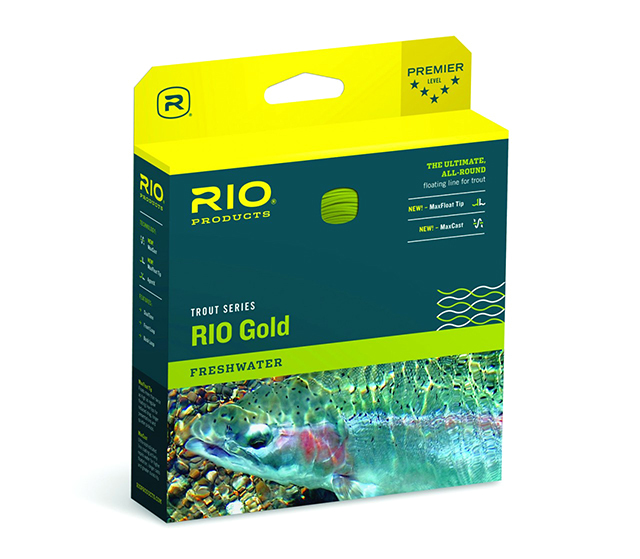 The RIO Gold Tournament version of this line is designed for long distance casting events, and features an extra-long head for maximum distance. Revolutionary design that allows for incredible loop stability and distance. Unique taper that easily loads a fly rod at close range. Front biased weight to load rods at close range. Taper design to cast flies between #22 and #2. Perfect presentation of flies between #22 and #2. The long back taper is excellent for mending and for roll and spey casting and the running line and head are different colours, defining the line's perfect loading point with the extraordinarily slick, dirt-repelling RIO's XS Technology coating as well as RIO's AgentX and Super Floatation Technology that ensures the tip and the running line will float high and shoot incredibly. A welded loop on both ends of the fly line facilitates changing leaders and allows for fast rigging and line changes. Airflo Sixth Sense Intermediate and Sinking lines take some beating for value. Airflo's Super-Dri Lake Pro has been specifically designed for the Stillwater angler. Phoenix Silk Lines are precision built fly lines made of the finest quality Pure Chinese Silk with tapers built-in by braiding. The most effective fish catching zone in the majority of lakes is within the top 6 feet of the water column. 1 metre clear intermediate tip. The Perfect Line for Czech, Polish, and French style Nymphing.